We have received a lot of emails from readers concerned about trout populations in Vermont post-Irene. 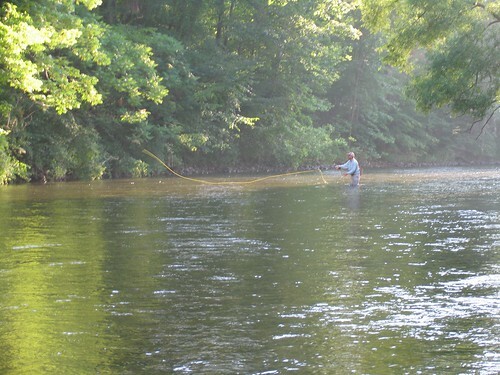 For the Battenkill, anyway, there is good news for anglers. It is not often that Monday morning brings good news, so I was very pleased to get an email this morning from our local state representative here in Sunderland. She was forwarding me a report from Ken Cox, VT Fish & Wildlife Fisheries Biologist on the state of the Battenkill river post-Irene and the condition of habitat restoration Orvis funded a couple of years ago. This message concerns how the Batten Kill has fared with Irene with respect to stream damages, habitat impacts, effects on habitat restoration, and trout populations. Yesterday, Dan MacKinley, Scott Wixsom (both with the U.S. Forest Service, Green Mountain National Forest) and I inspected the lower Batten Kill which I define here as the VT 313 bridge by the Arlington recreation field downstream to the NY state line. Even though the river overtopped its banks inundating numerous locations throughout its floodplain, the river came through remarkably unscathed. Very little new bank erosion has occurred, most of the large wood habitat structures installed into the river since 2006 remain in place, and the riparian woodlands are intact. Overall conditions remain pretty much as they were prior to the flood, and we were unanimous in our conclusion that it is extremely unlikely that the recovering trout population experienced any setback as a result of the flood. If there is anything good to be said for the timing of Irene with respect to trout populations is that it occurred before the spawning season and the river substrate is loose and not overburdened with sediments. So, the prognosis for spawning and egg incubation success looks good pending “normal” winter and spring river conditions. Being that the majority of habitat structures weathered this record flood event, we do not see any need to change their design and placement. There is no evidence that any of the large wood placed in the river resulted or contributed to damage to private property, roads and bridges. No doubt Irene caused much debris flow but most of this material appears to have originated from the Roaring Branch and Kelly Road washout. The new concrete arch bridge that replaced two old undersized culverts on Benedict Hollow Brook and designed to provide trout access to spawning habitat came through the flood fine and conducted water and any debris downstream without incident. Dan, Scott and I attribute the ability of the Kill to come through the flood event so well to so much of the flood plain continuing to be accessible river overflow which allows the river to lose power that can be destructive to transportation infrastructure, personal property and stream and riparian habitat. Furthermore, much of the upper river flows through wetlands that have the ability to dissipate hydraulic energy, store water and capture excessive debris and sediments. Where trees remain on the river banks (which is the case throughout much of the river’s length) banks are held in place minimizing erosion and large debris is retained within the river corridor.